Harold Jaffe is the author of 22 volumes of fiction, novels, docufiction, and essays, most recently Anti-Twitter: 150 50-Word Stories, OD, Paris 60, Revolutionary Brain, Othello Blues, and Induced Coma: 50 & 100 Word Stories. His books have been translated in France, Spain, Italy, Germany, Japan, Cuba, Turkey, Romania and elsewhere. 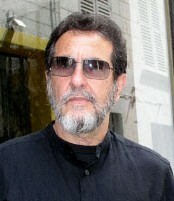 Jaffe is editor-in-chief of Fiction International. Hal, this collection covers a broad range of subjects, what with around 150 stories. Still, Induced Coma, the “degraded version of Nirvana,” is an intriguing opening piece and an apropos appellation for the entire collection. Can you discuss how the title “Induced Coma” speaks to the book as a whole? The world is perishing and we’re being fed bromides. Long before global warming the British socalist thinker Raymond Williams wrote that if there were a great and vast peril, world leaders would do one of two things: lie about it to service their constituency and maintain status; or simply, stupidly, not comprehend the peril. Williams was right. We are compelled to witness the consequences of global warming in banally capitalized ways: pop movies featuring post-apocalyptic zombies; biological humans miming cyborgs for an inorganic protection; undisguised economic cruelties toward the disadvantaged. There was formerly an invisible line which demarked a relative civility; in our collective but largely unacknowledged panic, that line has been oficially eroded. Many humans sense the horrific dangers and act them out without, as it were, inhabiting them. Induced coma. Along with Anti-Twitter, you’ve now written two books of stories comprised of 50 to 100 words. What are your thoughts on this concise form (or even the differences between the two, 50 and 100)? What are its challenges and its opportunitities? Paris 60 is also composed of very short texts, though not exclusively 50 and 100 words. My readers had been mostly of graduate school age until multi-tasking took hold and they became too busy gadgeting to concentrate on stretches of prose. I decided then that I would experiment with short texts encompassed by space, and if I thought I was losing quality I would abandon the experiment. If the constraints were not disabling I would stay with it. My miniature stories can be especially useful when I work with received texts–so-called news articles, for example, where I “treat” the text by inserting a line or two, or rearranging the format, or simply setting the original text in a different context, not altering the figure but the ground, hence defamiliarizing it. Many years ago I began my imaginative writing as a poet, that is, succinctly; in fact I have never strictly distinguished prose from poetry. And one of the few imaginative advantages of this [dis]informational epoch is the gruesome wealth of material that one can disinter. Your source index includes everything from the BBC, NY Daily News, and Al-Jazeera, to Mr. S Leather and Erowid Psychoactive Vaults. Did you develop a daily reading routine to help discover source material and spark story ideas? Nothing compulsive; just scooting around from one site to another until I need to surface for air. The tone of these pieces ranges from matter-of-fact journalistic to sympathetic to humorous. Do you decide how to treat a subject before you write about it or does it evolve during the process? How I respond commonly–though not always–evolves in the writing, often surprising me, the deconstructor. Induced Coma is soon being published by Anti-Oedipus Press. When will the book become available and how might readers find it? The volume will be officially published on August 1 and will available through the usual channels online and off. I have another volume of fictions & docufictions close to ready provisionally called Auschwitz Crumbling. Thanks, Hal. Is there anything else you’d like to share with or explain to readers?